Ukraine: Is The Retreat Of Russian-Backed Rebels For Real? MARIUPOL, Ukraine -- A thunderstorm loomed over Mariupol on the afternoon of July 6. To the north, the sky turned dark and a cool prestorm breeze kicked up as the sounds of distant thunder began to roll in. 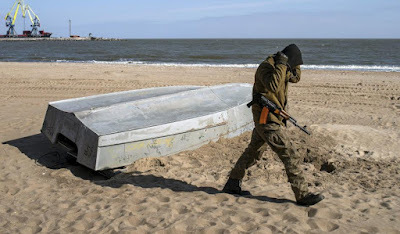 A Ukrainian serviceman walks on a beach in the port city of Mariupol on the Azov Sea, March 20, 2015. After a nearly five-month-long standoff, combined Russian-separatist forces announced on July 2 that they had pulled back from their positions in the embattled seaside town of Shyrokyne. Yet in nearby Mariupol, a city that has lived with war on its doorstep for more than a year, many residents are reluctant to believe that peace may be on the horizon. “I hope, but I don’t know,” said Olga Murza, 23, manager of the Natalka coffee shop. “The situation is very bad,” said Andriy Viktorovich, a 27-year-old bartender. “We all have paid a price—more than 60 KIA’s and 200 WIA’s,” the post continued. On July 2, a separatist representative to the Joint Centre for Control and Co-ordination announced the Shyrokyne withdraw. The Joint Centre for Control and Co-ordination, which comprises representatives from Ukraine, Russia, separatist forces and the Organization for Security and Cooperation in Europe, was created to administer the September 2014 cease-fire and remained in place after the Feb. 12 truce. The Organization for Security and Cooperation in Europe Special Monitoring Mission to Ukraine visited Shyrokyne on July 2 and confirmed the separatist withdrawal. In an earlier report, released on June 27, the Organization for Security and Cooperation in Europe announced that no civilians were left living in Shyrokyne, which had a pre-war population of 1,347, and that 80 percent of its structures had been destroyed by the fighting. Since July 2, the fighting around Mariupol has waned, leaving soldiers and civilians wondering what will happen next. Ukrainian soldiers deployed to defend Mariupol largely view the combined Russian-separatist fallback with suspicion. According to Ukrainian soldiers in the area, the retreat was a tactical move to limit casualties or consolidate forces for a later offensive. “The city is a zone of no control,” said Paul Moroz, a soldier with the Ukrainian National Guard Azov Battalion (recently upgraded to battalion from regiment), who is deployed to the area. “We are still occupying our positions on the hill and waiting for the separatists to come back,” he added. Ukrainian forces are mainly deployed along Shyrokyne’s beach and on a hill that overlooks the town to the east in the direction of Mariupol. Ukrainian troops on the hillside location live in a network of trenches, while soldiers along the coast mostly occupy abandoned homes and other buildings to shelter from artillery and sniper fire. According to Ukrainian military reports, combined Russian-separatist forces have abandoned vulnerable positions in the town center to limit casualties, but still currently have artillery and infantry positioned two kilometers away and on higher ground. If Ukrainian forces moved into Shyrokyne’s town center they would be vulnerable to artillery fire. The separatist fallback, therefore, has made Shyrokyne a ghost town with neither side willing to venture into no man’s land. “Occupying the city itself would be ineffective because we would be shelled,” Moroz said. The Organization for Security and Cooperation in Europe recently urged Ukrainian and separatist forces to jointly work to clear Shyrokyne of mines and booby-traps, and some officials in Kiev have suggested establishing Shyrokyne as a demilitarized zone. Ukrainian troops deployed to the area, however, pushed back against the idea of demilitarizing Shyrokyne or cooperating with the separatists. Some soldiers claim the combined Russian-separatist forces may be concentrating manpower and equipment for an assault in another direction, possibly from positions to the north of Mariupol near Volnakhava in an attempt to encircle and cut off the city. The Ukrainian Dnipro-1 Battalion recently released drone footage documenting the build up of a combined Russian-separatist base, including nine Russian T-72 tanks, near the village of Sontseve, about 40 miles northeast of Mariupol and along one of two main roads connecting the city to the separatist stronghold of Donetsk. With the growing threat of a combined Russian-separatist offensive from the north, Ukrainian forces consider defending Shyrokyne to be a critical bulwark to protect Mariupol’s eastern flank and also deny a high ground from which to shell Ukrainian checkpoints on the eastern side of the city. As of July 6, Ukrainian forces in Shyrokyne have held their positions. Five-day front-line rotations, divided between different National Guard Battalions, continue as before and no significant redeployment of equipment or personnel has been observed. For the residents in Mariupol, the lull in fighting is a respite from the constant sounds of war that have tainted life in this city for more than a year. Heavy fighting in August and September 2014, which included tank battles on the city’s periphery, and a January 24, 2015, Grad rocket attack on a residential neighborhood spurred many to flee. And since February, the sounds of heavy weapons from the front lines, which are about 10 miles east of Mariupol’s eastern limit, have become part of the normal background din. Those who remained have adjusted to life lived under the constant threat of attack. And while some see the combined Russian-separatist fallback as a positive move, many doubt whether it is a true bellwether for peace. “Future? What future? I have no money, and I can barely afford to survive,” Viktorovich said. One indication of the evolving security situation in Mariupol is the pervasive military presence, which is markedly different than it was in March and April, when soldiers inside the city center were still an uncommon sight. It is also much different than in September 2014, when the first cease-fire was signed. At that time the Ukrainian military restricted troop movements in the city to nighttime to limit interaction with civilians. Downtown hotel lobbies and restaurants, which have been near empty for months, are now filled with Ukrainian soldiers on leave or pass. At the Hotel Spartak in central Mariupol, groups of soldiers prop their loaded Kalashnikovs up against the walls as they eat omelets and drink coffee at the breakfast buffet. In the evening at a nearby restaurant on Prospekt Lenina, a line of painted camouflage SUVs is parked out front and the restaurant is filled with soldiers eating steaks. There is a nearly constant stream of military vehicles up and down Prospekt Lenina, the city’s main thoroughfare. The city’s civilians have also acclimated. While many residents are privately concerned about the war, life goes on. The city’s parks are filled with people, and beds of neatly planted flowers are blooming. Cafes and coffee shops are open. The downtown movie theater is showing Terminator Genisys and Jurassic World in Russian. Mothers push baby carriages on the sidewalks, and city benches are crowded with babushkas. “People have lived with this for one year, and they have adapted,” Murza said. “But I feel like my life has stopped,” she added. Murza speaks fluent English and graduated last year from Mariupol State University with a degree in management and hospitality.